Superdry men’s Ultimate snow rescue 20L backpack. This innovative backpack is a snow sport must-have this season. Designed with one large zipped compartment with side snap fasteners to attach your skis/snowboard to the outside of the bag and a second zipped outside pocket with a mesh pocket within it. This Ultimate snow rescue backpack also features a third compartment that is fleece lined to keep your goggles protected when not in use and a pull out helmet carrier in the bottom zip, allowing you to secure your helmet to the outside of the backpack. In addition, this backpack also features a padded back panel and shoulder straps for added comfort, with an adjustable waist strap to keep the backpack secure during activity. 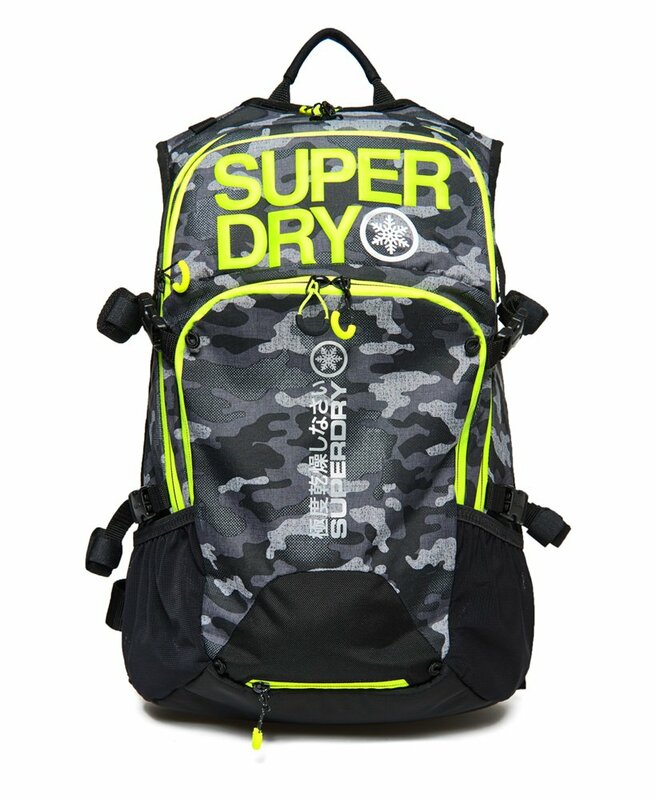 For the finishing touches, this backpack features a whistle on the snap fastener, a top grab handle, Superdry branded zip pulls and snap fasteners, reflective Superdry logos and piping as well as easily accessible side pouch pockets to hold your drinks.